BreakMentalDown: Funniest way to kill bikers? Randomly honk them off the road! Funniest way to kill bikers? Randomly honk them off the road! Bikes can exist with cars. Cars can exist with bikes. The above two sentences aren't ones that most people will dispute. But then again, there are those people. My use of italics should cause anyone who has ever ridden a bike to know exactly what I'm talking about. For some reason there exists a subset of people who feel the need to honk, yell and swerve at bikers. And it's not like the bikers are doing anything wrong, they're just going with the flow, following traffic rules. Those people though, they don't care—bikes represent a cancer who must be honked out of existence. I'll never understand the logic behind yelling at bikers. Now, this isn't some sort of “Jolly good, you're driving a very fuel efficient vehicle! Jolly jolly good,” because nobody is that British. Generally when drivers yell at me, I'm biking along a shoulder minding my own business, not breaking any laws. And of course, I'm wearing my bike helmet. This just infuriates them. They must live in some “Rebel without a Cause” fantasy land, and if they see a biker NOT breaking the law, it destroys their entire worldview. 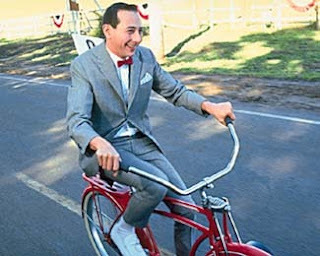 And I only look like Pee Wee Herman on a bike half the time! One of the most common occurrences is when cars honk. They pull near me, honk and then lean out the window laughing. It's not a warning, it's not a “Watch out! You're doing something wrong!” It's merely a honk to honk. It's like some sort of double whammy, the honk and the laugh. On one hand, I can see why they do this, because it scares and distracts the person in the much smaller vehicle, and it could even make them fall off said smaller vehicle. However, on the other hand, it scares and distracts the person in the much smaller vehicle and could make even make them fall off said smaller vehicle. That last paragraph wasn't the result of some cut and paste error, the reason people honk, yell and scream at bikers is the exact reason they shouldn't be doing it. It might seem funny to potentially kill someone, but the only time death is funny is when someone inadvertently slips on a banana peel whilst wielding a grenade. Which I rarely do on my bike. Recently, I was biking through a parking lot. As I entered the lot, I noticed this ogre of a woman trying to back into a space about 200 feet ahead of me. In the seconds it took me to close that gap, she had backed in, pulled out, backed in, pulled out several times. Assuming she had just gotten her license at the ripe age of 37 and/or she was drunk, I knew to keep my distance from her. I stayed far away, basically riding atop the cars she was seemingly failing at running into. After passing her, I did a silent prayer thanking the great bike god for keeping me alive through that ordeal. F&#$ing bike indeed. But also someone who could park if I had chosen to drive that day. I believe I came out ahead in that interaction.